A monotype is a print created by transferring to paper an image that has been painted on a plate made of metal, glass, plexiglas, etc. The process of transfer is done by either hand rubbing or using an etching or lithography press. 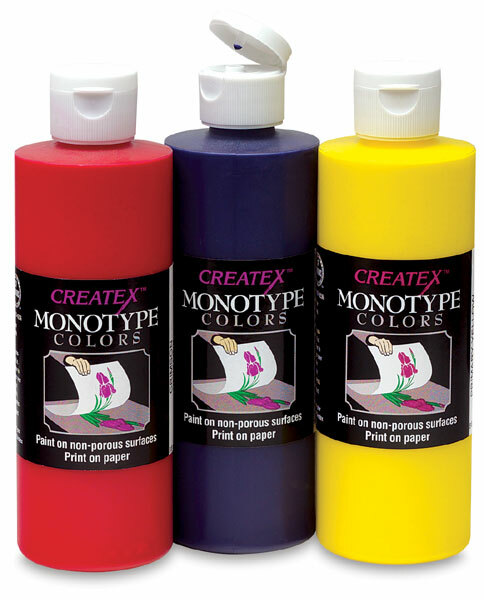 Createx colors are specifically designed for making monotypes. Unlike oil-based inks, Createx water-based colors can dry before printing. Dampened paper will rewet the color and transfer the image. This property of Createx colors offers the ability to ink several plates at once, then transfer the image later. Colors are packaged in 8 oz (.24 L) bottles. Createx Monotype Base comes in a 32 oz (.95 L) bottle. All colors are water-based, non-toxic, and permanent. Pro Set — This set of 12 contains 4 oz bottles of White, Black, Primary Red, Primary Blue, Orange, Phthalo Blue, Cobalt Blue, Violet, Phthalo Green, Raw Sienna, Burnt Umber, and Monotype Base. Sampler Set — This set of 8 colors contains 4 oz bottles of: White, Black, Primary Red, Primary Yellow, Phthalo Blue, Violet, Phthalo Green, and Monotype Base.